I’d like you to meet Zoey Cat, a former shelter kitty who is now a happy ranch cat! Her photo is in our CATsnaps banner. I’ll be sharing her story and more photos soon. Thanks, Zoey Cat, for being one of our CATsnaps Cats of the Month! I’d like you to meet Jean-Minou, a former stray who has become best friends with Ziggy, a handicapped pigeon. This story may be published soon . . . stay tuned for details! Thanks, Jean-Minou, for being one of our CATsnaps Cats of the Month! 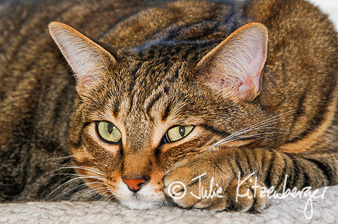 Velcro is a very handsome tiger cat with a purrfectly wonderful personality. Thanks to his guardians, Teresa and Will, Velcro was adopted into a wonderful forever home just in the nick of time, when he was 3 months old. He was a teensy tiny kitten and cute as could be! Time passes quickly when a cat is having fun, and Velcro is 4 years old now! He is so happy that, back at the shelter, he was allowed to bring his special shelter friend, Ginger — a small orange tabby — to his new home with him. In fact, although Velcro is a nice big cat now, he lets his smaller friend, Ginger, rule the roost. When you meet Velcro, he sometimes seems a little shy. 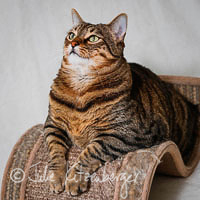 However, once we set things up to capture his portrait, he couldn’t resist showing off, sitting on his favorite S-shaped scratching seat and looking up. Sometimes he would reach one paw far out in front of him to snag his favorite ball, but he never got off of his perch. He must have posed for 30 minutes !! Velcro’s favorite relaxation spot is lying on his cat tree by the back window where the sunlight shines in and he can look out and watch those wily birds. 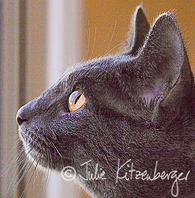 Velcro is a mighty hunter, and we were fortunate to capture a shot of him stalking an imaginary bird through the house. Velcro is a shelter cat success story. He knows he’s found the very best home a kitty could. 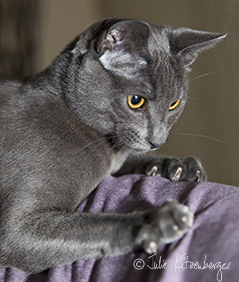 Thanks, Velcro, for being a featured kitty on the CATsnaps website and one of our CATsnaps Cats of the Month! The household already had one cat, a lovely 8-year-old domestic shorthair with the softest black fur, named Poes (pronounced “poos” — Dutch for “pussycat”). There was a bit of an adjustment period for Poes, as Nemo is a very bouncy kitty and jumps higher than any cat I’ve ever seen! Poes is old enough to be much more calm. But time helps these adjustments, and, with gentle guidance and patience from Marlies and Mark, Poes and Nemo get along well now. 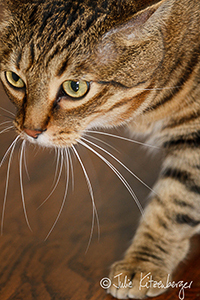 Nemo is a mighty hunter: he loves to chase the laser and capture his bird toy (feathers that dangle on a string from the end of a fishing rod). 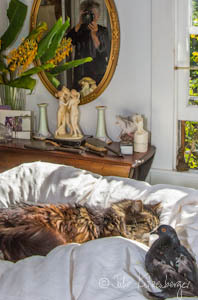 Nemo often carries the bird feathers through the house, jungle-style. 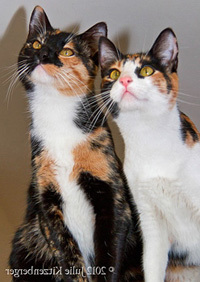 I spent two photo sessions with these kitties. For one shot, Nemo straddled the top of a chair and posed for me. I think he looks like a kitty movie star. He’s such a handsome boy, he could easily be a teen feline heart throb! 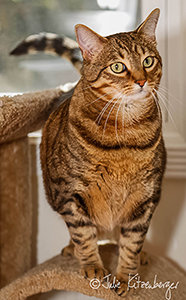 Thanks, Nemo, for being one of our CATsnaps Cats of the Month!